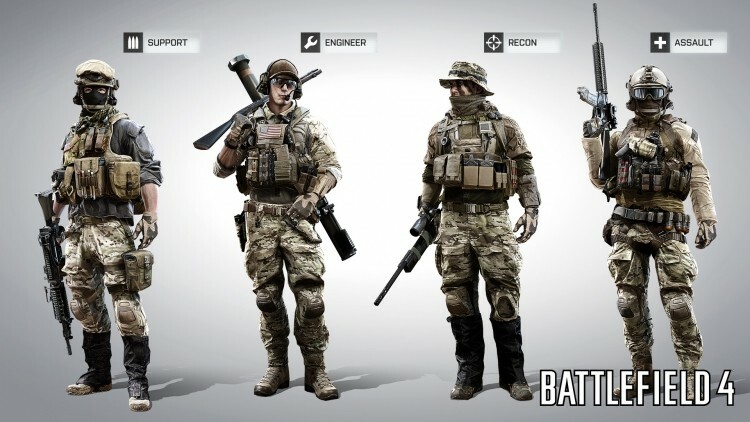 DICE has dropped some new information on Battlefield 4's multiplayer classes today. B4's core gameplay designer Alan Kertz took to the company's official blog to detail what players can expect out of the newly designed kits. Based on the classes from B3, the Assault, Recon, Engineer, and Support kits have been reworked to be both more versatile and deeply specialized. Each class will be availble from the Chinese, Russian and U.S (pictured above) armies. This time around the Engineer will have a lot more options in terms of Anti-vehicle weapons and DICE has reworked vehicle disables and guided weapons systems. This includes the RPG-7V2 or the various fire-and-forget weapons like the MBT LAW. Remember the Wire Guided Engineer Missile from Battlefield 2? Kertz said that's in there too. The Support kit has been enhanced to offer a bit more offensive capabilities with the XM25 air burst grenade launcher and redesigned remote mortars to attack from a distance. Along with ability to equip DRMs and carbines, DICE has decided that the Support class will retain its C4 and claymores from B3, based on community feedback. The new Recon kit has been designed to be more mobile and to include revamped sniping mechanics. You get a carbine, C4 or claymores and motion sensors along with the returning MAV, T-UGS and Radio Beacon. The sniper rifles have been rebalanced, will include the ability to set an aiming distance and come with "additional optics and accessories," according to Kertz. Lastly, the Assault kit will remain as the game's traditional run-and-gun/medic class. You got med packs and defibrillators, but also some newly added mobility with First Aid Packs that allow you to heal a single soldier over time. You also have the option to bring along some room clearing, 40mm Flash Bang rounds instead. Battlefield 4 is coming to PC, Xbox 360 and PS3 on October 29 in the US, October 31 in Australia and November 1 in the UK, with Xbox One and PS4 versions expected this holiday season.